This fast, handsome model from Navajo sports a "handle forward" grip for the best of instinctive accuracy and heavily deflex/reflexed limbs for fast shock-free performance. This tried and true model from Navajo offers great shock-free performance and comfort in the hand. The Diamond provides excellent instinctive accuracy and is capable of smooth draws out to 30", this great recurve is a good choice for big & tall archers. Navajo's uniquely sculpted grip locates the hand precisely every time you pick it up. 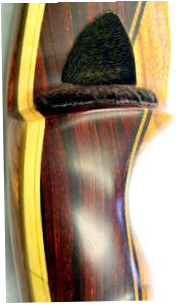 Good looks and rugged performance abound for archers seeking a unique, comfortable and accurate bow for all uses. Contact us for current pricing and availability on all Navajo bows.